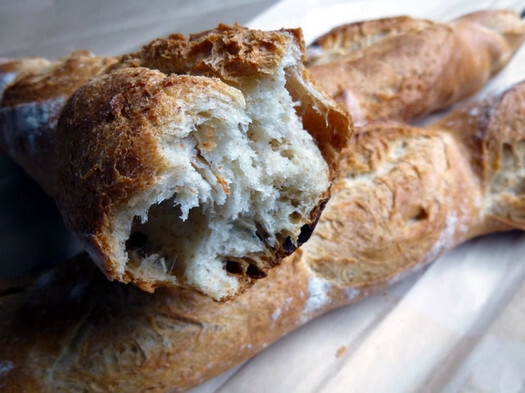 When did crusty bread lose its crust? I'm not kidding. 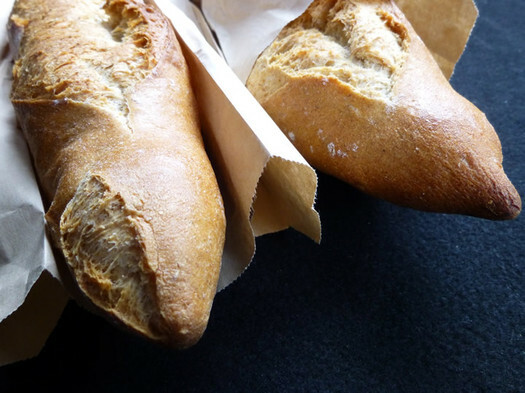 The elongated loaves that try to pass for baguettes in most places are anemic shadows of the form. All you have to do is give their sides a squeeze and feel the crust yield under gentle pressure. Baguette crust does not yield. Baguette crust holds firm. If it does succumb to pressure, it cracks or breaks with shards of crumbs cascading in every direction. 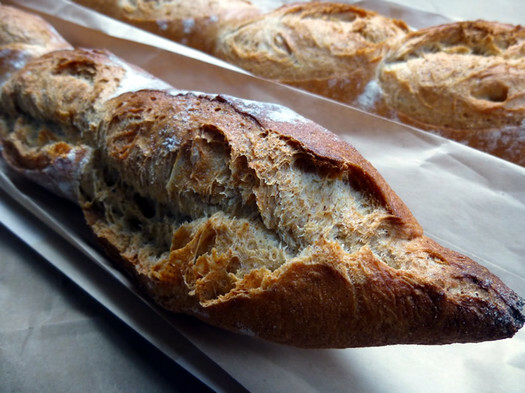 With real crusty bread you have to be careful, especially when it's a 22-inch long baguette. You could hurt somebody with that thing. And if you aren't mindful about chewing, that somebody could be you. Because crusty bread can have sharp jagged edges that can pierce the roof of your mouth. This is bread that commands your respect. Even if its outsides are a little rustic looking and flour dusted like the loaves produced at The Placid Baker. This is serious bread. Biting through the substantial crust you get to the crumb within. This is surprising because there is clearly some amount of whole wheat flour in the dough, but there are plenty of air pockets to keep it on the lighter side and the whole wheat flour adds to the grainy, savory, and satisfying flavor. But the thing that puts this loaf over the top is that if you can to the bakery shortly after 10 am your baguette will be warm from the oven. Then you may just have to buy two. One to eat immediately, and one for later in the day. I could eat the baguette from the Placid Baker for every meal. Spread it with butter and maybe some jam for breakfast. Tuck some meat and olive spread inside it for lunch. Eat it alongside cheese and a bottle of wine for dinner. Any bread that was left over could be turned into French toast, savory bread pudding, a thickening agent for soups, or even simply breadcrumbs. Bread should never go to waste. Because even when it gets hard, it's good for something. And when it's this good, you want to eat every bit. a Placid Baker croissants was one of the last items i ate before having to give up wheat for health reasons. it was delicious and brought me back to Paris. Placid also makes these delicious "flat breads" that are excellent avec fromage. I couldn't agree more. This is the only local baguette I'm willing to buy and it is worth the price. A hunk of this with some good salt butter is heaven. And if you don't want to drive to Troy, a batch of these baguettes is delivered to the Honest Weight food co-op Saturday mornings, I believe. The baguettes I had in Paris recently were around â‚¬ .80 or $1. People buy them by the arm load. Perhaps it's an economy of scale thing. All I know is that at $3.50 a pop I can't afford to eat bread like a Parisian. I've been a long time fan of the Crown Point Bread co. as well. You are so right, Daniel. My mouth is watering from the photos! They sell at the Tuesday delmar farmer's market also. The whole loaf rarely gets home without a heel or two missing. 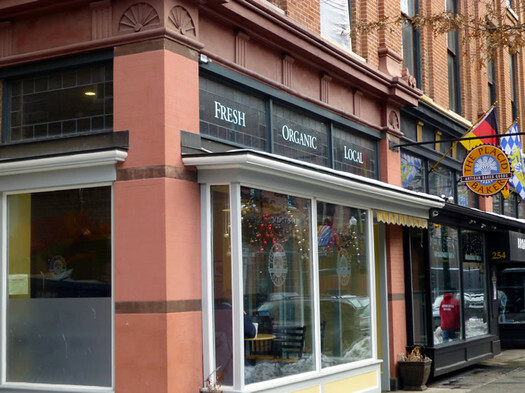 I stand corrected -- the baguettes are delivered to the Honest Weight Food co-op on Fridays. They also sell The Placid Baker's most excellent ciabatta.